I think I've finally come to the realization that I really, really love Richard Linklater movies. After first being introduced to the filmmaker without knowing I was being introduced to him in 2003's School of Rock, I slowly became more of a fan as I discovered that not only did he and Jack Black create that insanely re-watchable and universally loved comedy, but that he had his own strange franchise of sorts with Before Sunrise and Before Sunset, that he was diverse enough to try something like A Scanner Darkly before capping off his Before trilogy with Before Midnight and then re-teaming with Black for the highly underrated Bernie in which he uses skills he no doubt honed in his 2006 documentary, Fast Food Nation, to blend the documentary and feature into some kind of hybrid true story tale that was both unique and contained just the right amount of kitsch while still being of a respectable quality. All the while creating something of another experimental masterpiece that culminated with 2014's Boyhood. So, where would the director go next? Well, that his career kicker, Dazed & Confused, has not yet been mentioned is not without purpose as this tale of students on their last day of high school in 1976 feeds directly into Everybody Wants Some!! as Linklater's latest chronicles the first weekend of a college freshman at his new school in 1981. Though this latest effort didn't immediately strike me as a great film I couldn't stop thinking about how much fun it was. Even now, over seven months later, I've re-watched the movie two or three more times and despite those I've shared it with not immediately sharing my adoration for it I can only expect/hope they can't shake the experience and come to realize the skill it takes with which Linklater seems to so effortlessly craft his dialogue. Director Denis Villeneuve's previous three films (Prisoners, Enemy, and Sicario) have each landed within the top fifteen of their respective years, Prisoners ranking as high as number five in 2013, on my favorite movies of the year lists. With the rapid rise of this seeming auteur it was with both great anticipation and anxiety that I awaited his 2016 release. Being that news broke this year that Villeneuve would be directing a sequel to Ridley Scott's 1982 cult hit, Blade Runner, starring Ryan Gosling and the return of Harrison Ford as Rick Deckard it seemed this direction in the entertainment news cycle signaled a gloss over of Villeneuve's alien invasion tale titled Arrival that was based on a short story by Ted Chiang. Fortunately, this preconception couldn't have been more wrong as Arrival turned out to be one of those movies where you understand you're waiting for the resolve to see if it justifies the journey you've taken to (pun intended) arrive there, but where that understanding still doesn't render the one hundred minutes prior unnecessary. Every moment of Villeneuve's meditation on time and interpretation via the guise of an alien invasion film is fascinating and worthwhile. Though it's clear we're ultimately waiting to see what bigger picture these pieces are painting. Villeneuve has proved himself a master of restraint and the slow burn, but Arrival may be his most accomplished work to date as not only is it visually enrapturing, but the larger ideas the film has on its mind are applied to its precise visual sense giving the experience an all-around aura of awe. Manchester by the Sea is the film on this list I'm least likely to watch again, at least for a while. That said, it's also the film that elicited the biggest emotional response from me in terms of depicting a tragedy I personally haven't experienced, but still being able to transcend such barriers. 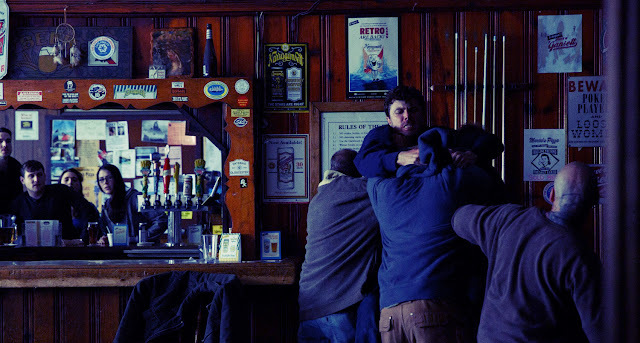 I went into Writer/director Kenneth Longergan's (You Can Count on Me, Margaret) latest more or less blind as to what the film carried in terms of narrative and with only the buzz it garnered out of Sundance earlier this year to signify that it was one worth watching. No matter if you know the basic premise or not though, one thing is for certain: one cannot know the whole of the story the film is telling and it is in how Lonergan sets up the present scenario for our characters to operate in and then how he slowly peels back the layers of each of their pasts that helps us to understand not only why and how these people have become who they are, but also giving us a glimpse of how far they can go and what the future might hold for them that makes the experience so simultaneously simple yet equally involving. It's a powerful piece of human drama to say the least with bare bones emotions bleeding through on the face of Casey Affleck who will undoubtedly garner and maybe even win a Best Actor nomination at this years Oscars. As a writer, Lonergan is clearly interested in digging into the psyches of those who have dealt in tragedy and analyzing the different ways in which we as human beings deal with such surreal, life-altering events. With Manchester by the Sea the writer/director tackles permanent heartbreak to grandly moving results. Zootopia was great, Finding Dory was fine enough, The Secret Life of Pets was average at best, and Kubo outranked Zootopia fairly easily due to the pure craft on display not to mention the rather affecting story it told, but then along came Moana and it was clear to see that not only was this the best animated of the film in my opinion, but one of the very best films of the year. Being an audience member who grew up in the nineties with some of my fondest Disney memories being those that include Aladdin, The Little Mermaid, and Hercules. Well, wouldn't ya know it? Moana directors Ron Clements and John Musker just so happen to be the same guys who crafted all of those nineties classics among others and thus know a thing or two about what it takes to craft a classic Disney animated film in terms of what I think of as classic. More over, Clements and Musker are well-aware of the anatomy of a Disney movie and how best to perform such a feat as creating something that is both fun yet familiar. Moana is very much an amalgamation of all that has come before it while encapsulating all that Disney's brand of animation can be moving forward. 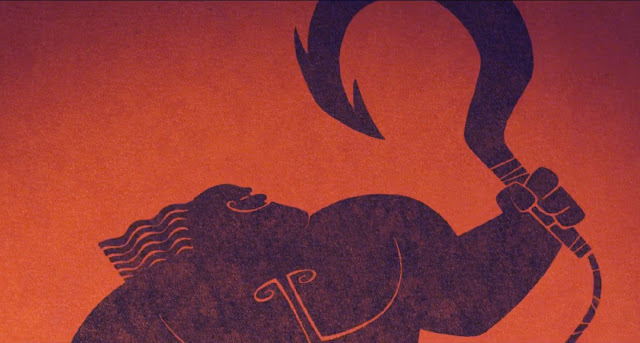 Taking cues from those that have come before, acknowledging them in humorous ways, and then going on to execute them in exceptional ways Moana is something of a treasure that never slows down and continues to surprise by not necessarily going in any unexpected directions, but more by being as creative as possible in the approach it takes to those directions. I was unable to drop the smile and/or awestruck expression from my face for the entire runtime; for this and for its keen sense of when to borrow and when to innovate Moana is easily my favorite animated film of 2016. Midnight Special is a precisely paced and methodical piece of work from auteur Jeff Nichols who only continues to impress with each new film. While many will place Nichols other film this year, the more awards friendly Loving, on their list I found his exercise in genre filmmaking to be more affecting this year if not telling as important a story. There is something beautiful about Nichols attempt at creating a sci-fi film that reminds him of his own childhood with feelings of innocence and of attachment, of love and love as an obligation all expressed in subtle and nuanced ways that leave the viewer feeling almost spiritual. I may be of a slight bias considering Nichols is from my hometown of Little Rock, Arkansas, but I think you'd be hard pressed to find anyone who goes to the movies quite frequently that disagrees with the fact Midnight Special is an impressive achievement if not a special kind of something. Every aesthetic choice helps to inform the interpreted meaning behind the narrative. With the score from David Wingo and the cinematography by Adam Stone aiding the emphasis on the Spielberg/Carpenter influences as well as the juxtaposition between the mundane world of the southern region of the U.S. and the magic of Alton Meyer (Jaeden Lieberher of St. Vincent) the film is not only one of great beauty, but an immersive experience that will be difficult to escape even weeks after seeing the film. Save for maybe Batman V Superman or Civil War I hadn't walked into a movie prior to The Lonely Island's Popstar: Never Stop Never Stopping with bigger expectations. Needless to say, it was The Lonely Island who disappointed the least. It just so happened I was at the perfect age of 19 when Andy Samberg and his crew debuted their particular brand of viral comedy on Saturday Night Live in 2006 and I've been a fan ever since. Whether it be their collaborations with Justin Timberlake or their ability to make a song sound insanely credible while being equally ridiculous there was always something to be entertained by, to laugh at, and to marvel at. The Lonely Island may put on a goofy and juvenile persona, but they are commentating and highlighting on timely societal issues and constructs. After three albums and a slew of directing jobs for Akiva Schaffer and Jorma Taccone The Lonely Island have come together to bring us what feels like, in many ways, what they were always meant to create. With Popstar, the trio have created a Timberlake/Bieber/Macklemore hybrid called Conner4Real who is the star of his own popumentary that goes south when it becomes clear that his second solo album will be a massive commercial and critical failure. With new original songs like "I'm So Humble," "Finest Girl (Bin Laden Song)," and "Mona Lisa," combined with some of the most observational and consistent humor I've seen in a comedy this year Popstar is as re-watchable (noticing a theme?) as it gets and more fun than you might imagine if you think this isn't your cup of tea. Despite the fact the film flopped and virtually disappeared from theaters less than a month after release I can only hope this thing will garner a following much like its spiritual cousin This is Spinal Tap did back in the eighties. I'd been looking forward to writer/director Damien Chazelle's follow-up to Whiplash ever since the credits rolled on Whiplash and so, when I heard the young, but ambitious Chazelle would indeed be following up that more than impressive debut with an ode to Hollywood musicals of years past and that it would star as close a screen duo we have these days to something like Fred Astaire and Ginger Rogers in Ryan Gosling and Emma Stone it was impossible to not be excited. When the film was pushed from its original theatrical release date in the dead of summer where it would have faced off against the all-female Ghostbusters to the mid-December date it more or less confirmed that Summit Entertainment knew they had a serious Oscar contender on their hands. Of course, the fact it was pushed back five months wasn't pleasing news to me as it was clear the region of the country I'm settled in wouldn't be receiving the platform release until late in December if not until January. 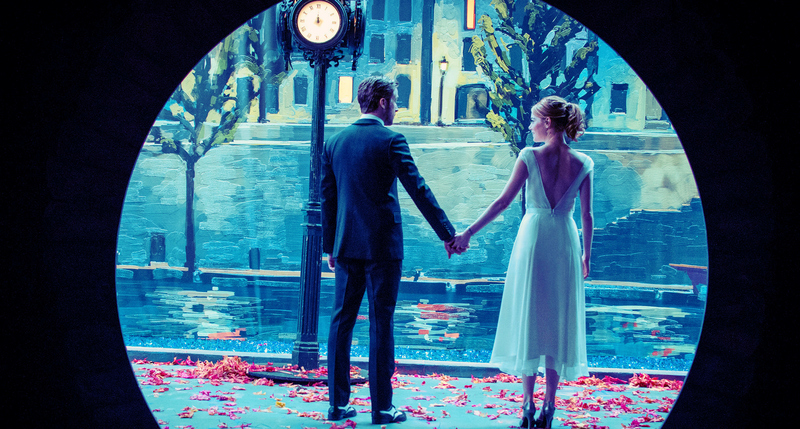 Thankfully, Summit decided to go wide on Christmas Day thus making La La Land my final theatrical experience of 2016. Not a bad note to end on. This movie could very easily go as high as number two on my list as everything except for my number one is pretty much interchangeable and while I'd hoped for a little more choreographed song and dance from the picture as a whole the opening number is a true stunner and one would be hard-pressed to find a film that is as joyous an experience as it is an honest one. With La La Land, Chazelle isn't simply looking to recreate images and feelings afforded him during his youth as he watched Gene Kelly dance across the screen, but more he is interested in exploring the consequences of having such aspirations; the dark side of fame that doesn't necessarily have anything to do with addiction or other harmful habit forming activities, but more with the decisions such individuals have to make without knowing the answer as to what they'll regret more twenty years down the road. Can I be the person I want with the person I want? Is it worth more to make a life as I so desire or with the one I desire? The simplest way to put it is that Moonlight feels important. It unfortunately feels necessary. It feels vital. Adapted from the unproduced play "In Moonlight Black Boys Look Blue" by MacArthur Fellow winner Tarell Alvin McCraney Moonlight takes us through three stages of the life of Chiron. As a young boy, a teenager, and a grown man director Barry Jenkins (who also adapted the screenplay) chronicles the life of Chiron in a way that both simply and oh so complexly transcends all barriers of politics and beliefs and presents a bare bones human story that just so happens to deal with being black and being gay. More than this though, Jenkins and his incredible cast that includes Alex Hibbert, Ashton Sanders, and André Holland as Chiron as well as the impeccable Mahershala Ali, the glorious Naomie Harris, and the on the verge Janelle Monáe (just wait until you see her in Hidden Figures) allow Moonlight to address the long existing stigma that to be hard or worthy of being a man one must be largely indifferent to those things that naturally give us weakness in the world. By tackling this idea and how it affects the growth and development of one underprivileged youth is at one time to present exactly what it promises while at another painting a much broader picture of this toxicity that has been constructed by society for which many young men are led to believe there are certain actions that have to be taken or certain attitudes that must be adopted in order to make them worthy of being a man. 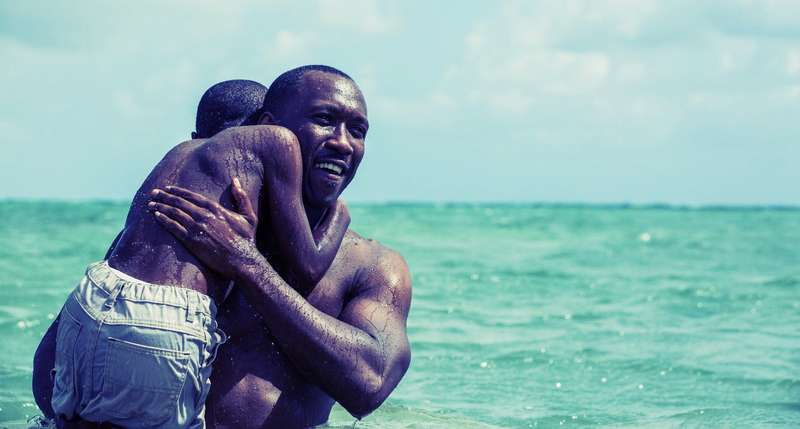 Moonlight is a film that, anytime you think about, are reminded of, or even consider the ground it covers and the essence of what it embodies not only in its ideas and themes, but in its nearly flawless execution, inevitable feelings of great sympathy and understanding come with them. More than anything, Jenkins understands the human element at the core of these issues and by parlaying as much through the single perspective of Chiron at three different stages of his life we are delivered a fleshed out portrait of the true internal tendencies versus the ideals we're taught we should become. 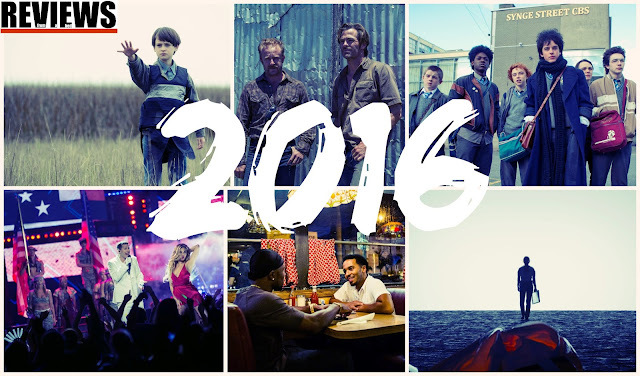 I only gave out two five-star ratings in 2016 and so naturally, those two films are what make up the gold and bronze of my favorites of the year list. After a second viewing of screenwriter Taylor Sheridan (Sicario) and director David McKenzie's (Starred Up) collaboration this week that is Hell or High Water it is only all the more clear how well constructed and executed a modern Western this film actually is. With four outstanding co-lead performances from Chris Pine, Ben Foster, Jeff Bridges, and Gil Birmingham Hell or High Water is both, as John Legend in La La Land would phrase it, "traditional yet revolutionary." The film is very much steeped in the archetypes and beats of any Western from the illustrious genre, but it deals in contemporary and relevant themes and ideas that propel the film into a modern day setting with a modern day mentality. Most revealing in Sheridan's piece though is the moral ambiguity that Mackenzie and both Pine and Bridges convey through their opposing positions in society despite the honor of their intentions being very much the same. 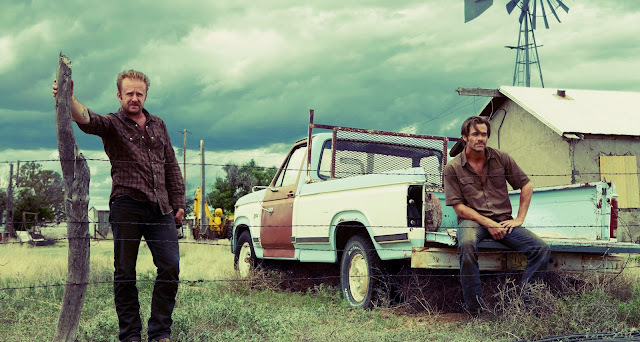 Combined with cinematographer Giles Nuttgens beautiful photography, Nick Cave and Warren Ellis' original score as well as several appropriate soundtrack selections, and a surprising amount of humor exemplified through lines such as, "On your last day in the nursing home you'll think of me and giggle," to even landing a "That's what she said," joke Hell or High Water literally packs in everything one could hope for in a piece of entertainment. It delivers an emotional payload, it's funny, and it talks about something bigger than itself while perfectly encapsulating those bigger ideas in its small story. Unable to find anything wrong with the film and having no complaints, it's easy to see why this is one of my favorite films of 2016. Director John Carney's (Once, Begin Again) latest music-infused narrative about a boy growing up in Dublin during the 1980s who escapes his strained family life by starting a band to impress the mysterious girl he likes is pure magic. 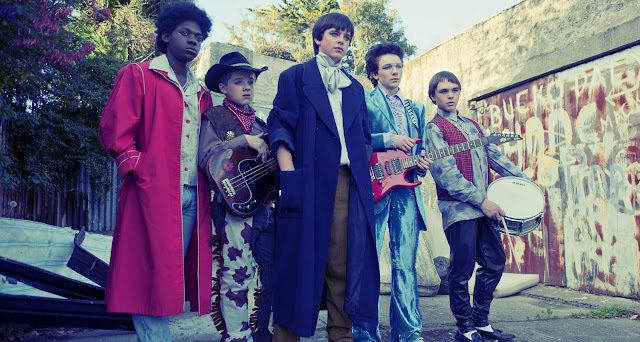 Sing Street not only appeals to the re-watchability factor I tend to find necessary (it's easily the film I've seen most this year), but it also connects with the soul inside me that always yearned to be a musician and songwriter. Part of me knows and fully understands that I love this film for the personal connection I've created with it and the landslide of an emotional impact it had on me. Seriously-I was in tears as Conor (Ferdia Walsh-Peelo) and Raphina (Lucy Boynton) sailed off into the mist leaving Jack Reynor's Brendan behind to never fully realize his potential. My mother grew up in England (which I know isn't Ireland, but close enough), I heard about "Top of the Pops" my entire childhood, I ate Mars bars until my heart's content, and as my mother was a teenager of the early eighties I felt like, in many ways, I was taking a trip through what it might have been like to be her at a younger age than even I am now. There is also the factor of once being in a band with my own brothers and being willing to create our own music and put it out there for the world to listen to, enjoy, and criticize. The relationship between the two brothers at the core of the film is key to the heart of Sing Street and it spoke volumes to many a personal experiences I've had in my own life. I'm not saying I connected with this film more than others will be able to because I've had these experiences, but for these reasons specifically I feel a deeper relationship to this film than with anything else I've seen this year.